Developed to bring spice and freshness to any drink, Monin Ginger syrup will stimulate the senses with its strong nose of ginger root and raw ginger aroma. Mainly grown in Jamaica, Africa, India, China and Australia, ginger or ginger root is from the same family as turmeric and cardamom. Raw ginger is used in stir fries and curries, in marinades and is grated to make tea. Dried ginger works well in puddings, flapjacks, cookies and fruit cakes or stewed fruits, particularly apple. It is also used to make ginger ale or ginger beer. 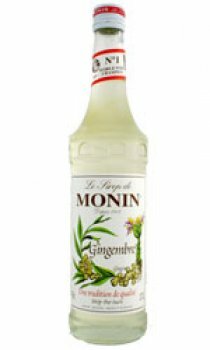 Create nice and spicy teas, coffees, cocktails and fruit punches which exude the warm fragrant spice flavour of Monin Ginger syrup.